On sale! 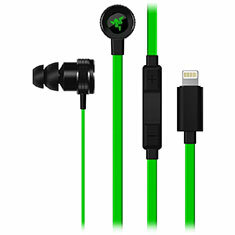 (normally $129) The Razer Hammerhead for iOS delivers pure audio fidelity thanks to extra-large 10 mm dynamic drivers and a custom-tuned digital-to-analog (DAC) converter. It gives you deeper bass tones and superior acoustic clarity, whether for music, games, or everything in between. Stay fully immersed in the sound with noise-isolating bi-flange ear-tips and be in total control with the in-line remote. With an aluminum body and flat cables, these in-ears are truly made for toughness on the go.